Ok so all this talk about Planes and shooting boards I thought I would throw something in as well. 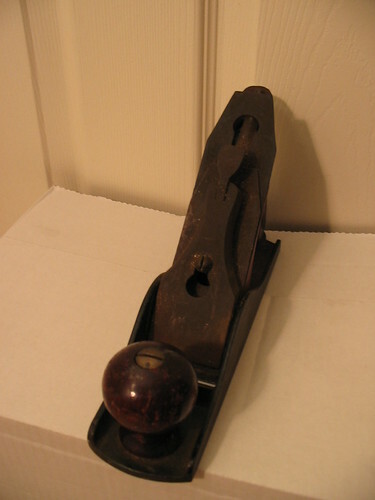 I just recently found a plane in my parent’s shed, my guess is that it was in my grandfather’s toolbox at one point. From what I can tell all the parts are there. There is no manufacturer on it but it has some stickers still left almost intact. I tried to get a good shot of them. I am more then likely going to pick up a couple of books on plane use as I do not see myself buying a planer in the near future or fitting it into my shop right now. Plus I am finding I like using handtools more as I work on things. Anywho…. any assistance anyone can give me on what it is I already have I would appreciate. Nice little plane. Looks like a #4 sized Dunlap. My guess would be from the 1950s. Yep, read Wayne blogs on how to rehab it and it will help you on your way. All you need is a #5 and a 6 or 7 and you are in business. The iron is good and long. 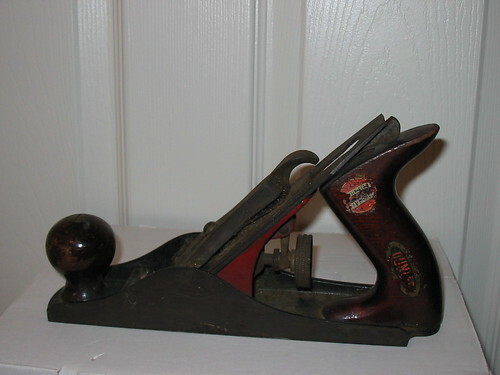 There is no reason that this can’t be made into a really usable smooth plane. Looks better than most things that have been in my shed for just a spring or two. Nice find Chris!